Unique coffee comes from unique places, those with production techniques rooted in tradition, blessed soil, and a happy human and natural environment. Its profound aroma mixes chocolate and cinnamon beautifully, and gives way to a delicate citric acidity. The cup is well balanced, complex and full of character. Flavors last long as the cup finishes nice and clean. The farm manages the the entire production chain of its coffee. This starts with seedling production and continues through cultivation, bean picking and milling. Our success in managing the coffee production chain has been proven by our consistently high quality product. Quality and traceability are always guaranteed. All the coffee is grown at a high altitude: from 820 to 1,400 meters (2,700 to 4,600 feet) above sea level. The terrain allows for varieties like Caturra to flourish in the rich volcanic soil, cool night temperature and high humidity. Through having its own mill, and processing only its own cherries, Aquiares controls quality of its coffee from the plant to the bag. The mill, or “beneficio” was the first in the country to be registered with the Costa Rican Coffee Institute (Icafé) and thus has the singular ID number of #001. As coffee cherries come from the field, they move into Aquiares’ own mill that very day. 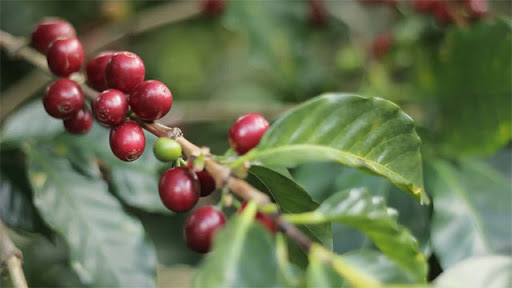 A coffee cherry has several layers: first the pulp which turns red when ripe, then a slippery layer called mucilage, which is mostly made up of sugars, then the parchment which is a husk that surrounds the bean, and finally the bean, which is ultimately roasted. In the beneficio, the pulp and mucilage are removed, before they are segregated into two qualities using water: sinkers and floaters. Sinkers have greater density and better quality. Beans are then dried in 36-hour driers (fueled by wood sustainably harvested at the farm) until the humidity is lowered to 10.5%. After each batch is dried, it is tasted for quality assurance. The dry beans are then stored for a month in large silos to allow humidity and aromas to settle. Finally, the beans return to the Beneficio where the parchment is removed and the beans are sorted by size, weight, density and color, before they are bagged for export. To ensure consistent quality, all Aquiares coffee is picked by hand. During the harvest, each tree is visited up to seven times to ensure that only fully red ripe beans (called ‘cherries’) are picked. Given that the pickers represent the farm’s most valuable asset, Aquiares invests heavily in their well being. All workers have a safe work environment and a comfortable place to live. The farm sponsors doctors’ visits and nutritional consultations for pickers and their families twice a week. Aquiares has also established first-of-its-kind physical therapy sessions and instituted a daily warm-up routine for its employees. The farm’s agricultural objective is to find the synergies between environmental health and coffee plant health. Such synergies ultimately create long-term stability in the production of high-quality coffee. Soil health is the is one of the most important parts of any successful agricultural operation. For this reason, Aquiares’ agricultural practices work to build and maintain soil quality. For example, the organic matter provided by shade leaf litter feeds soil microbes. In turn, decomposition provides coffee plants with organic nutrients. In addition, native trees provide shade to slow coffee ripening. A longer ripening process allows the bean to absorb more sugars and makes for a better cup quality. Aquiares mainly grows the Caturra variety of coffee. That said, the challenges posed by climate change and pests require constant experimentation with new varieties. To do this, the farm has developed a Varietal Garden were more than 30 promising varieties are being tested for cup quality, pest resistance and productivity. While large by Costa Rican standards, the farm still takes care to give individual attention to each of its trees. Aquiares takes the time to prune each plant independently, instead of pruning by row or lot. Aquiares’ brand is defined by such a sustainable agricultural approach that both ensures quality and promotes environmental responsibility. This coffee is selected from beans picked from the entire farm throughout the harvest. The beans have good hardness and weight, but are smaller in size, and have 10-20 defects in 350 grams. This coffee is selected from the middle section of the farm, between 800 mts. (2,625 ft.) and 1,200 mts. (3,940 ft.), exclusively from the middle of the harvest season. The beans are hard and heavy (minimum 80% over Z16 and maximum 8% below Z15), with fewer than 8 defects in 350 grams. This is the best coffee of Costa Rica’s Atlantic region. It is selected only from the high-altitude section of the farm, between 1,200 mts. (3,940 ft.) and 1,400 mts. (4,595 ft.), exclusively from the middle of the harvesting season (November to January). The beans are hard and heavy (minimum 90% above Z16, maximum 8% bellow Z15), with fewer than 8 defects in 350 grams. Using this preparation, we export our specialty coffee micro-lots. We focus on selecting varietals that are planted in the higher parts of the farm, between 1,200 mts. (3,940 ft.) and 1,400 mts. (4,595 ft.), and harvested in the center of the crop season (November to January). The beans are hard and heavy (minimum 90% above Z16 and maximum 5% below Z15), with less than 5 defects in 350 grams and no primary defects. Guided by the concept that ‘bigger is better’ we have developed this beautiful coffee which features beans sized 95% over screen size 18. The physical aspect of this coffee is a sight to behold, and it’s performance in the cup is nothing but exceptional. 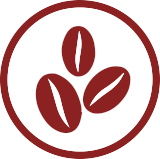 Aquiares is able to offer this unique Caturra Varietal coffee because of its abundant rainfall year-around which enables plants to “feed” their beans non-stop. Usually, coffee cherries develop two beans inside, but when a plant suffers from some sort of stress, it will randomly produce peaberries. These particular cherries only develop one bean, which takes up the nutrients and space that the other would’ve otherwise occupied. The result is a more powerful coffee, with bright acidity and complex flavours. 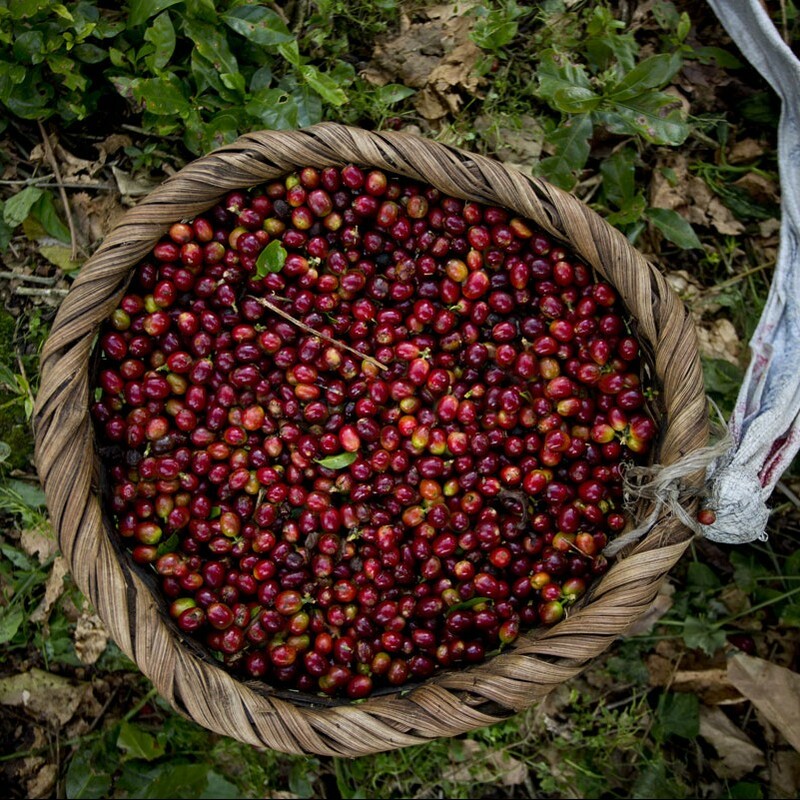 We select only the largest-sized peaberries (98% over screen 11 “ojo chino”) to offer a truly special coffee. Our honey-processed coffee comes from selected high altitude lots in the farm, which are carefully hand-picked and brought in small batches of separate varieties to be de-pulped at the Beneficio. By leaving the mucilage attached, and allowing coffee to a slow (2-3 weeks) sun drying process, we have come to obtain a cup with a complexity that transcends borders, with unique caramel and fruity characteristics.